Preorders are for items that we have posted on our website which the manufacturer has indicated will be produced and available at some future time. This also includes items that are currently sold out and are being reproduced. These items all have some future available date attached to them. Backorders are basically the same as Preorders. The essential difference is that the items are still available from distributors but we currently don't have any in stock. We will be able to order these items and get them for you within a reasonable amount of time. 3. Do I have to prepay for Preorders and Backorders? No we don't request any monies from you up front. You will be notified by email when the item requested is available for you to purchase. A link is included in that email allowing you to purchase the item through the normal checkout process. At that time we will require you to pay in order to receive your item. 4. I received an email indicating my item is available for purchase. Now what? The email we send you contains a link directly to the Pending Items page of our site. You will need to "Sign In" in order to view the page. If you wish to purchase the item simply click on the "Add to Cart" button and proceed to checkout. Use the browser back button from the Cart screen to add additional items if you have more. You can also browse through our extensive inventory and add additional items to your order as well. Access to the Pending Items page is also available from within your "My Account" page. The link will only be available if you've preordered or backordered items. 5. How long do I have to purchase Preorders and Backorders once I'm notified? You receive our email on Jan 1st. You place the item in your shopping cart on Jan 3rd. You sign in again on Jan 18th and the item is still in your shopping cart. You decide to checkout and pay for your order without incident. 6. Is my Preorder / Backorder item exclusively available to me? Yes but only for the quantity requested. No one else will be able to purchase the item reserved for you. However, if you haven't added the item to your shopping cart within 14 days or purchased it within 21 days then it will be available for others to purchase. 7. What happens if I don't do anything about my Pending Items? If you fail to add the item to your shopping cart within the 14 day window or you do not purchase the item within the complete 21 day window, you will receive an email indicating that you failed to meet this criteria. At this time the item will be added back into our regular inventory giving someone else the chance to purchase it. In other words, it is no longer exclusively yours. 8. I received an email indicating my Pending Item has been returned to normal stock. Can I still purchase the item? Yes but only if we have inventory. The item could have already been purchased by someone else. In this case you will need to start over again and we will attempt to acquire more inventory if possible. 9. I received an email indicating I didn't complete my order through PayPal. Has my order been received? Yes this is an informational email only! When you chose to pay via PayPal during checkout, a message under the payment option requested that you click on the "Return to BAD L's Hobby" link once payment was complete. We require this for your order to be taken out of "PayPal Processing" state. Since our inventory doesn't get updated until this happens, there is a possibility that someone else may purchase the item out from underneath you even though it was paid for. In order to keep our costs down and give you the best price that we possibly can, we refrain from paying PayPal a monthly fee to process payments. It's bad enough they charge a percentage of every purchase along with a transaction fee. This is a difficult question to answer since it varies based on weight and size of package as well as locale. 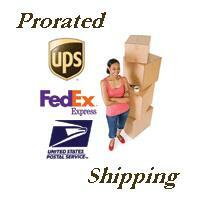 We offer three forms of shipping to domestic locations: USPS, UPS, or FedEx. International locales are only offered USPS International Mail. You will need to register an account on our site and proceed through the checkout process until you reach the shipping screen. Here you will be given your shipping costs. We go through the same process for any inquiries as well. 11. Can I get discounted shipping? We have introduced pro-rated shipping. You will receive a 5% discount automatically for any order. You will receive an additional 1% discount for each $500 that you spend on our site as long as you use the same account. The more you order, the bigger the discount. Maximum discount matches the total shipping cost. This discount is applied independent of locale. Everyone is eligible to receive the same discount no matter where you live.